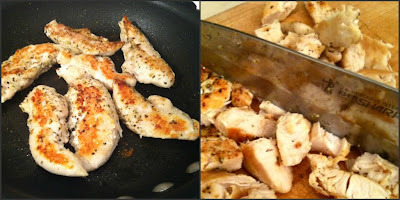 I've been wanting to share this recipe with you guys for so long, as it's one of my favorites and definitely one of my go-to meals. For one of my bridal showers back in the day, someone made this for the luncheon/kitchen shower and I l-o-v-e-d it. It's now a staple in the Davis household. You can serve it hot or cold and it's delicious either way. You can change the flavors up with the type of veggies you use, too. -Heat up olive oil in skillet and cook veggies until they are browned a little and cooked through. I also season mine with some garlic salt. 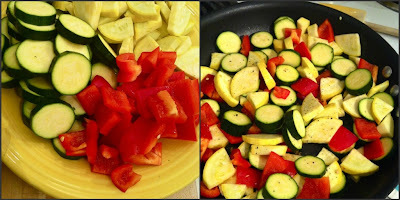 -Once the veggies are done, put in bowl and set aside. -Boil water and prepare pasta as shown on package. -Heat up more olive oil and season chicken with italian seasoning, garlic salt, and salt/pepper. 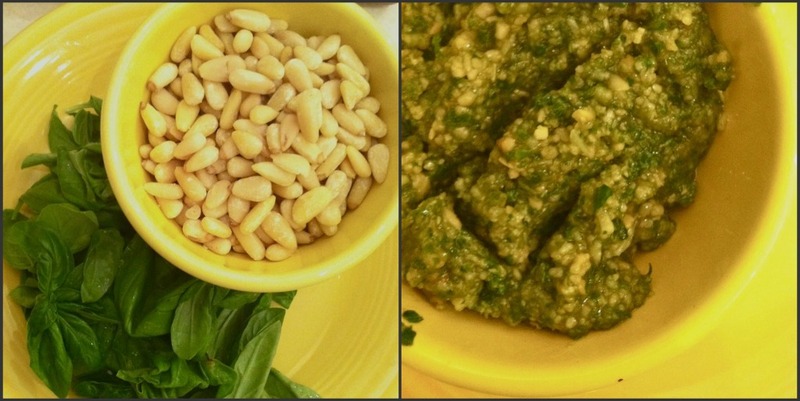 While the pasta & chicken are cooking, this is when I make my pesto. Toss some basil leaves, pine nuts, chopped garlic, parmesan cheese, (I don't measure. oops), and olive oil into food processor and add olive oil until it is desired consistency. 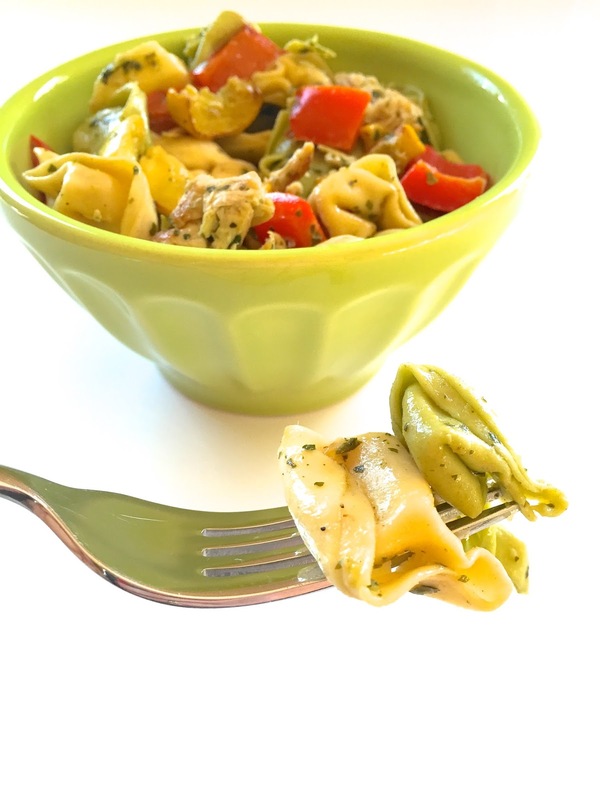 -Toss pesto, chicken, veggies, and pasta together in large bowl. Season with salt & pepper and sprinkle with fresh parmesan. Enjoy and refrigerate left overs...eat it cold for lunch the next day. YUM! omg, it's like you read my mind! serioulsy. i wish you could see my face right now. i just got off the phone with husband and was like i need a new lunch idea (started working out recently and wanted to cut down on sodium..like those frozen heat up meals) and he was like what do you normally crave at lunchtime? and i said i really want a good cold pasta salad idea. was clicking around online and found you AND this recipe. 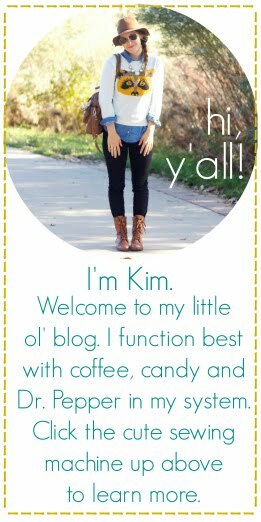 LOVE IT, love your blog too. following it and you on twitter :) have a good day!!! This sounds absolutely delicious, even if pesto isn't the world's most appealing condiment to photograph! That looks & sounds DELICIOUS! 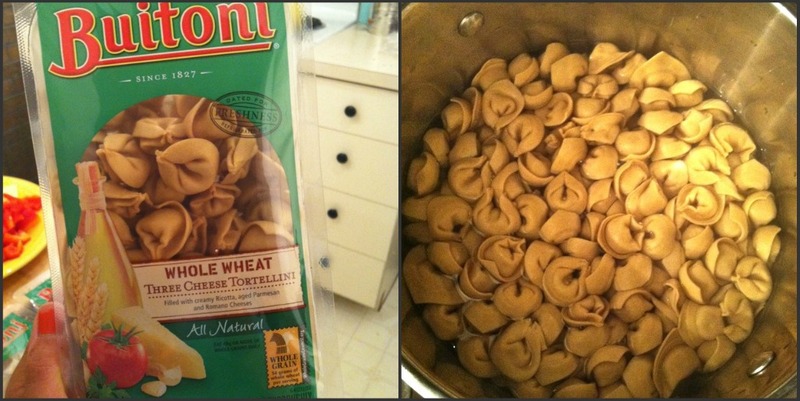 And now I'm craving tortellini...too bad the caf at school doesn't have any!